What to make of Saboteur, a blend of Shiraz, Mourvedre and Cabernet Sauvginon from Luddite in Bot River? No doubt it’s a striking wine but the 15% abv and all that comes with it seems out of kilter with the general movement towards greater refinement in local reds. The 2013 shows red and black fruit, spice and scrub plus a slight malty character on the nose. It’s rich and flavoursome on the palate – not too sweet and not too savoury. The tannins are smooth and, it must be said, the wine is not entirely without freshness. It might not be the most elegant wine out there but it does have real personality. Approximate retail price: R185 a bottle. 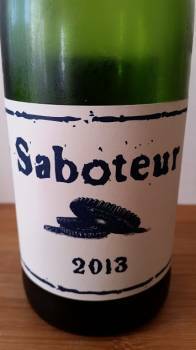 Try the new Saboteur White 2015 for refinement and elegance. But not all reds need to be refined, it is all about balance.